aft.1635-1684 m. Sarah Johnson 1663? The earliest known ancestor of the Wood family of Melton Hall, Suffolk was Richard Wood who was born about 1546, presumably in Yorkshire. Little is is known about him except that he probably lived in Sharow, a little village (without a church) only a mile east of Ripon. 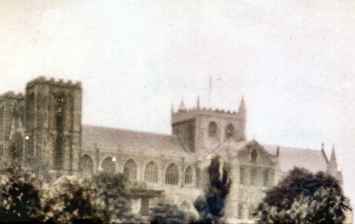 Sharow Ripon was given on two of the baptismal records, the children being baptised in Ripon. The first monks at Ripon came from the monastery at Melrose in Scotland which was founded by St Aidan in 660, but they were replaced by Augustinian canons and St Wilfred was appointed as their abbot. In 672 he replaced the old wooden church with a stone building. This was the time of the dispute between Celtic and Roman Christianity and Wilfred, on becoming Bishop of Lindisfarne, which favoured Celtic practice, transferred the See to York and later when appointed to Hexham refused to allow Ripon to become a diocese. 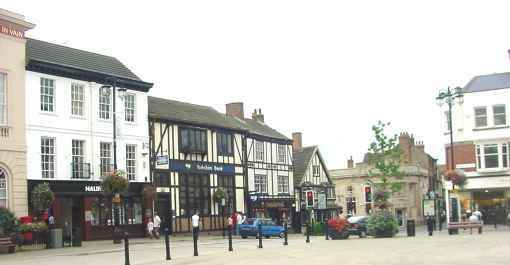 He himself eventually returned to Ripon where he died at the age of 75. In 934 Ripon, growing in status, was granted the privilege of sanctuary. 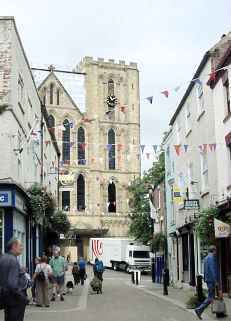 Wilfred's minster was destroyed by Vikings in 950. All that remains of this church is the crypt. 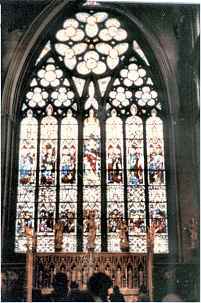 The Augustinian canons remained until 1547 and the dissolution of the monasteries at the Reformation. The church was destroyed twice more, in the 10th and 11th centuries but was restored by the Normans. At 133 ft it has the 5th longest nave in the country. The three towers were once topped by spires but the central one was struck by lightning in 1593 and blown down in 1660 - dramatic events which must have been talked about in the Wood family. The other two spires were also then removed for safety and never replaced. 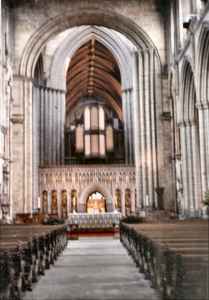 Although now called a Cathedral this is an anachronism as it was not the 'seat' (cathedra) of a bishop until the appointment of the first bishop of Ripon in 1836. Most of the Wood family were baptised in this church. It is assumed that Richard and Isabel had no surviving issue. The Wood family line continues with Francis who married Mary Kirk probably about 1634. Bardsey, with which Francis is associated, is a small village 7 miles NE of Leeds. They had a son, also called Francis but a brother may be mentioned in the Spencer-Stanhope MSS - see below. 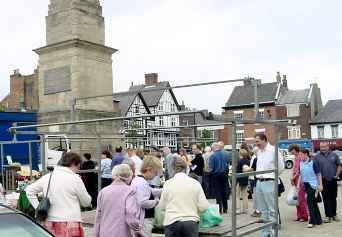 Francis Wood (2) married Sarah Johnson on 22 Jan 1663 in Ripon and they had 13 children all baptised in Ripon. (Note:- b. = birth, not baptism. Source - Family Bible) The Ripon records show a Mary, wife of John Johnson of Ripon, buried on 6 Jun 1673, so it is possible that John and Mary were the parents of Sarah. Seven of the children having died, only six seem to have survived into adulthood. 9. Robert b.1674, 'son of Francis Wood, dec'd' was apprenticed to a linen draper, John Vickers of Leeds on 1 Jan 1689 . This was about 5 years after his father died . [The record of this Apprenticeship is in the Spencer-Stanhope MSS.] Bills and accounts are preserved under the name of 'Robert Wood of Ripon' from 1686-1691 among the same MSS. It is not known for certain at present if either Robert - the apprentice linen draper or the one with bills and accounts - is the same as the son of Francis Wood since apprenticeships would usually last for a few years. Note - in the word 'ye' the letter 'y' replaces an obsolete form of 'th'. Pronounce as 'th'. One of the 12 aldermen, known as the Wakeman, (the same as a 'watchman') was appointed for a year. It was his task to appoint the constables to patrol the streets and keep order in the city at night. At 9 pm a 'hornblower' set the watch by blowing a horn by the cross in the square. The constables - the 'watch' - could arrest criminals and also had to recompense the victims of crime but householders had to pay the sum of two pence for each of their outer doors every year for this 'insurance'. This ancient tradition which is said still to continue, must have been familiar to the family The Wakeman (=watchman) governed the city until the first mayor was appointed in 1604. 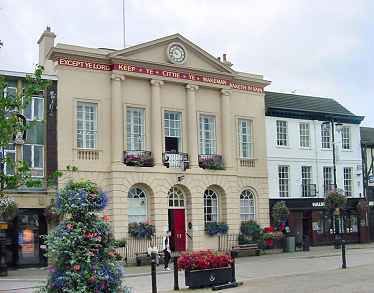 Johnson Wood was an alderman at the beginning of the 18th century but this 'town house' on the Market Square was not built until 1798 and only given to the town in 1897. Francis Wood (2) is described in a document from the Ingilby Family of Ripley Castle, in 1679 as an 'attorney at law in the Court of Common Pleas'. He would probably have travelled a great deal, to meetings of the assizes and to the quarter sessions and also in going back and forth to London to the Inns of Court of which he would have been a member. David Hey in The Oxford Companion to Local History says that no men made as much money in a short time as attorneys at the end of the 17th century, with their regular drafting and executing of wills, deeds, settlements, mortgages and leases, or managing of estates and collecting rents. Francis it seems was no exception. He appears in quite a number of documents of this type listed on the A2A website. Hey further claims that "Some [attorneys] were able to retire to a rural property which they had purchased from the profits of their business." In the light of this the following raises a number of questions, mainly of genealogy and identity, but also about Sharow as well as other property further away at Dacre Banks. On 13 May 1674 'Francis Wood of Ripon, gent.' leased '3 beastgates in Dacre Pasture in the territories of Dacre,' property acquired from the Buck family, to Matthew Wood of Bainton, clerk, his brother, for 1000 years at a peppercorn rent. This appears to refer to Francis Wood (2) since his sons were very young. Francis (3) being only ten and his brother Matthew four years old, the family of Matthew Wood of Dacre Bank confuses the issue. There is no other evidence at present for Francis (2) having a brother Matthew, but Matthew of Bainton could be an articled clerk who came from Dacre Banks (Bainton is about 9 or 10 miles N.W of Beverley). And any of them could have moved into or out of Ripon at some time. The documents themselves may solve the problems of identification but there must be two distinct families. The repetition of the names also suggests that they were related. There are details of land leased by Francis at Horsforth and Sharow (fields?) from the Spencer-Stanhope family from 1677. One mentions Francis taking on a 7 year lease - 'Between Francis Wood of Ripon, the elder, Gent, of the one part, and Ralph Barker of Ripon, baker, of the other part; of a close called Tofts, in Sharow.' There is a receipt from Francis dated 22 Feb 1682, and a list of securities of 15 Sep 1687 (after Francis (2) had died!) . Some of these papers to do with his business as attorney such as a marriage settlement of 19 Sep 1677 between John Stanhope of Horsforth Esq. where Francis stood beside Henry Layton of Radon, Esq. 'in consideration of marriage between John Stanhope and Hannah Horsman.' The crucial question in this case was one of property! There are also three Warrants of Attorney, two of 1681 and one of 1683 among the legal documents which are held by the West Yorkshire Archive Service at Bradford. Francis (2) died in 1684 but the above documents and more not listed here, almost certainly refer to him. After Francis died his widow, Sarah was also involved with a couple of leases. One for seven years in 1685 concerned a close, Topham Lowfield, in Sharow, and the other in 1686 was concerning a two year lease on a Kelcarr Close in Sharow. More may be added here when these documents have been consulted. Francis Wood (3) appears on a marriage bond of 19 Mar 1686. The document in Latin, says he was 23 and, 'of the parish of Woolley', a village between Sheffield and Leeds - and some distance from Ripon. Ann Wrighton, aged 21 was from Normanton, perhaps the daughter of George Righton and Mary. A possible genealogy is included below but so far the only evidence for this is the IGI. 'Francis Wood the Elder', his father, had died in 1684. Francis the Younger as he was called, was only just 21 that year. He could have been a member of the Inns of Court at that time and would still have needed 'articles' as now with a qualified solicitor. This is perhaps what he was doing in Woolley, or somewhere nearby. (Before 1728 there was no definite set period for these) It is not known how long after the marriage bond the actual marriage took place between Francis and Ann. Their only (known) child was Richard, not born until 12 years later in Ripon. Much later, on 28 Mar 1712 Francis (3) appears in the Monk Ings file 'Feoffment - ref. WYL230/675', the original document being at the West Yorkshire Archive Service in Leeds. (Feoffment is a way of conveying a freehold estate) This record includes some other persons named Wood who are not identified. Perhaps they were cousins and Mary Myers was their sister? "From William Wood of Low Bishopside, Francis Wood of Ripon and Thomas Wood of Heyshaw, yeomen, to Mary Myers of North-Woods in the parish of Ripon, widow and William Myers her son of North-Woods, husbandman, of a parcel of pasture at Monk Ings within Dacre Pasture called High Pasture, 2 closes called Farr Close and Narr Close, a way and 2 closes meadow ground." 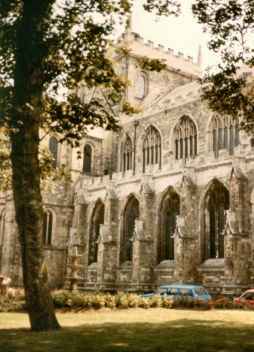 Richard Wood (3) solicitor, now in practice in London, probably in the Aldersgate area, came from Ripon and had settled in London where he married Mary Seedall of Preston on 29 Jun 1722 at St Mary Magdalene, Old Fish St, London. Little is known about Mary herself. She was living in the parish of 'St Martin le Grand' at the time of her marriage. Did she return to live with any of her own family in Islington? The family bible lists Mrs Ann Dobney, 'sister to the above Mary Seedall later Mary Wood ' who died in Islington on 15 Mar 1760 and was buried at Clerkenwell on 24 Mar 1760. Ann's age is a puzzle as the entry in the bible is not clear. On balance the most likely age was 87, though this makes her 22 years older than Mary. Also recorded in the family bible is the death of Mr Arthur Dobney. He died on 6 Dec 1744 aged 73 and was buried in Islington Churchyard. In the context of the entry in a Family Bible Arthur could be her husband. If Ann was 87 then Arthur was 12 years her senior The next entry was 'Mary Gore Granddaughter to the above Mr Dobney. Died 22 May 1747 Aged 15 Years.' There is no mention of Ann here so, if she was his wife Arthur could have been married before. For the moment these relationships remain an intriguing mystery. Another event recorded in the family bible concerns yet another member of the Seedall family, William : "Mr William Seedall, Bro. to Mrs Mary Wood Died at Islington, Febry 25th 1758. Aged 69 Years." They had four children, all born in London. 3. Mary Wood who died 19 Feb 1778 was buried in Cripplegate Churchyard.on Sunday 1 Mar 1778. Richard Wood (3) died in London in 1736 aged 38 leaving his wife, then about 31, with 4 young children.. Mary [Seedall] Wood died at the age of 36 on 31 Jul 1741 only 5 years later. She was buried in Islington Churchyard, London. In this family and at this time the godparents of the children were frequently the same people - they were the ones no doubt most to be relied on for help (as guardians?) in such a case when both parents died. In August 1741 the children were all still minors, Sarah was 15, Richard 14, Mary 12 and Robert 6. The Wood Family continues with the 7th generation, Richard Wood (4) and Jane Searles in the 18th century. When Francis Wood 'of Woley' was 23, Ann 'Wrighton' was said on the marriage bond dated 19 Mar 1686 to be 21, ie born in the (old calendar) year of 1665 or 1666. This appears to make Ann, dau. of George and Mary, too old to be identified with her..
Francis Wood was born on 27 Nov 1664 and baptised on the 21st. This Ann would therefore be older than him, not two years younger. 'of this parish' may only mean that a person was residing there at the time. Any further information would be very welcome.